Amazingly rad picture snapped back in the '50s. 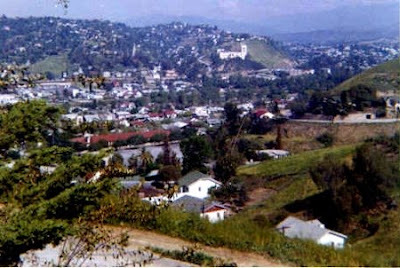 When there were seven houses in a row, with empty fields all around, at the top of Montecito Dr. Love the dirt road at the bottom of the frame. What a time to live on the hill! Earlier this year, I wondered if the same angle could be found. The closest I could get was at Pagoda and Montecito which had a very similarly lovely view of the Arroyo. You can even still make out the now faded red roofs of Latona Elementary (which must have just been built in the 50's?). It seemed fitting to post the old picture now reading about the fierce neighborly uproar over a fence that could block this view forever. From what I've read, no one seems to know how tall the fence will be, whose view will be lost, on and on. And with the City mucking around now, who knows what will happen. I'm sure it will happen slowly though. Unfortunately things change, hillsides reshape, views get lost, and then it becomes all new again. Be fortunate for the vistas we still have all over the hill. Old and In The Way "I Lost It"
Jackie Mittoo "Jump The Fence"
You can look at it this way - in 50 years someone will say "2009? What a time to live on the hill!" that's the good thing about bureaucracy -- things rarely get done. I worry because the technology for building on hillsides is now here. 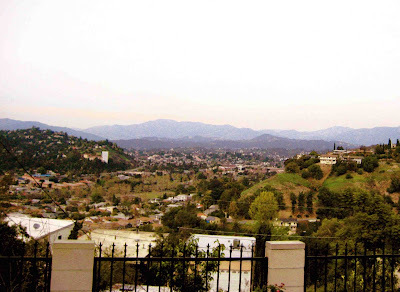 During the recent real estate boom, I saw for sale signs on hillsides I assumed were city owned and unbuildable.